Was there a defining moment for you to get into the industry? Oh a defining moment. I think there’s been a handful of breaks, I guess you could call them, and I’ve had a number along the way and, you know, you got to work hard and you’ve got to get lucky, and I feel like I’ve had a couple like getting into USC really helped, you know, that really helped, just because the pros and cons of going to a graduate film programme and a lot of times the people who profit the most are the ones who often have other ways of penetrating the system, of like finding a way into the business, either they grew up around it or they just have a different or more developed skill set that enabled them to find their way in, but if you don’t you have to find those access points and that’s really hard to do when you’re out in the cold, and going to a graduate programme really helps, that’s my experience. But then along the way you know, I know what I wanted to do for a long time and I certainly had ambitions as a young man and I think as far as three real breaks that really helped I would say; getting out of film school, one of the first places I ended up working was for Morgan Neville who ended up winning an Academy Award years late for 20 Feet from Stardom and so having an opportunity to work with someone who was really good really helped because it immediately got me inside an ecosystem of high end documentary work, which was really really fortuitous, and then you know, I think the biggest break that came thereafter was getting hired to edit Pearl Jam 20 for Cameron Crowe, I was a big fan of the band, I was the right age; I’d grown up around it and it was just a really big project and a project I really wanted, you know I wanted to do it, I felt like I was the right guy for it, and really set my sights, my design, on figuring out a way to get that gig and did and that was a big break for me, because it was a really high profile project and it’s a bigger project for me and again working with an extraordinary accomplished film-maker, and then the last thing was getting this Clive Davis project recently was a really big break, you know these are the (can’t make out) events that sort of, you know, push you up on the ladder when you think about it, and I thought Pearl Jam was a jump for me and then having this opportunity to direct the Clive Davis project, Clive Davis: Soundtrack of Our Lives, was a really big break for me, I’m really appreciative of the fact that Scott Free, the production company took a chance on a younger maybe slightly greener, (in that capacity?) film-maker than I’m sure some of the other people they where considering and yeah it’s meant a lot. Hopefully it’s established me as more viable doc director, you know, which is where I wanted to be. Wonderful. So switching gears to the Foreman documentary, where you a big fan of the legendary George Foreman before embarking upon it? Yeah I was a big sports fan, I had edited ESPN's 30 for 30 that was also about a figure in the boxing world who was called the “Real Rocky” which was about Chuck Wepner which is funny because I edited that one and we deal with the “Rumble in the Jungle” in that film as well because Ali ended up fighting Wepner after he beat Foreman in the “Rumble in the Jungle” because he was kind of looking for an easy fight and of course the story there goes that Wepner gave him a much better fight than he anticipated and became the inspiration for Rocky. So yeah I was a Foreman fan and also just a sports fan in general, I just loved really great sports stories, you know there’s a reason why they make such great films, they’re just inherently so dramatic and the conflict is so concrete and they’re so inspiring and they’re always about men. Boxing in particular, is about people trying to fight for their lives both figuratively and literally, and I was a big fan going in, but I learned a tonne and I’m of the age where I remember his comeback, I remember the Comeback George and then I remember obviously George the Grill Guy, everybody knows George the Grill guy and younger fans only know George the Grill Guy, I was of an age where I remember the comeback. I knew from my father that George had been perceived as really mean guy in the 70s, but I hadn’t really seen any of that stuff. My father was a big fan and he would tell me about the earlier incarnations of George and what a tough guy he was and how dramatically different he was as a personality and as a fighter and his physical physique as well, it all sort of changed and transformed before the comeback, but I hadn’t really seen or experienced any of that, I knew of it, but once I started researching and digging into the film you know and started doing the research to try and pitch the film really, you know, I got really excited and became really, really sort of enthusiastic and passionate about the project because it became very clear to me just how dramatic that transformation was and almost sort of shocking to me that story had really yet to be told. There was an opportunity to kind of tell that story through two generations eventually who really do not recall that first generation of George and was largely unaware. What was it about George Foreman that made him the perfect subject for you to explore? I have a sports documentary background and I’d actually been exploring a project when I became interested in George’s comeback story, just as Angelo had been in Ali’s corner in the Rumble in the Jungle and George’s corner 20 years later when he won the title back I began to construct the story around that. 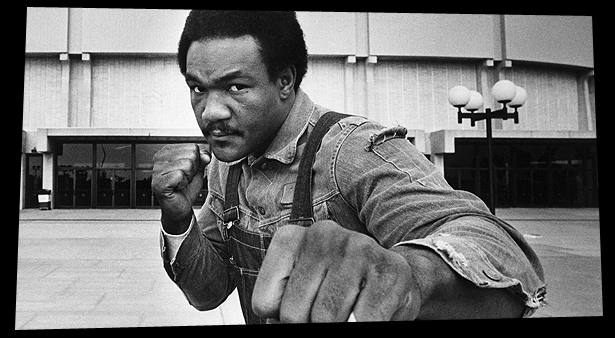 As we dug in a little deeper and started to include the Foreman family the story just evolved into George’s story, a more concentrated telling that really focused on George, and I was really honoured, flattered and privileged to have the opportunity to tell the definitive George Foreman story which has, surprisingly to me, has not been told.